Background: Chronic thromboembolic pulmonary hypertension (CTEPH) is usually underrecognized due to nonspecific presentations. Undiagnosed CTEPH leads to unnecessary investigations for other diseases, and more importantly, increased morbidities and mortality. Objectives: The aim of this study was to define overall CTEPH incidence and the rate of CTEPH after acute pulmonary embolism (APE) in a tertiary care university hospital and to record risk factors, clinical and imaging characteristics, diagnosis assessment, and management methods. Materials and Methods: The retrospective 5-year data, between 2012 and 2016, was extracted. Out of 1751 patients, we screened, 286 had, at least, evidence of pulmonary embolism. CTEPH was diagnosed in 20 patients, and 12 in this group had characteristics of combined APE or history of APE. Results: The overall incidence of CTEPH was 37.8 cases per million patients, and the incidence of CTEPH after APE was 5.1%. The most common presentation was progressive exertional dyspnea (50%). All patients were diagnosed by computed tomography pulmonary angiography combined with echocardiogram. Surprisingly, only two patients had investigations with ventilation/perfusion lung scan. None underwent the preferred curative surgical treatment of pulmonary endarterectomy and two had balloon pulmonary angioplasty. All patients received anticoagulants, while only 5 patients were treated with pulmonary arterial hypertension-specific drugs. Conclusion: CTEPH was uncommon in our institute, with an underuse of the standard test. Suboptimal diagnosis assessment and management remain critical problems. Developing a properly trained CTEPH care team would improve patient outcomes, but cost/resources may be prohibitive for such a relatively rare disease. Trial Registration: TCTR20180220008 registered February 19, 2018. Chronic thromboembolic pulmonary hypertension (CTEPH) is an uncommon complication of acute pulmonary embolism (APE) but associated with high morbidity and mortality.,, The clinical presentation of CTEPH is usually nonspecific and may lead to misdiagnosis or delay in recognition.,, The cumulative incidence of CTEPH after APE varies between 0.4% and 9.1%, and CTEPH in the general population is about 1–91 cases per one million person-years. However, the data regarding incidence of CTEPH in Asia are scant. The risk factors of CTEPH can be divided into three major groups: (1) plasmatic factor: factor VIII, lupus anticoagulants, and antiphospholipid antibodies;,, (2) venous thromboembolism-related risk factors: previous pulmonary embolism (odds ratio [OR] 19.0), larger perfusion defect (OR 2.2 per decile decrement in perfusion), idiopathic pulmonary embolism at presentation (OR 5.7), or recurrent VTE (OR 14.5); and (3) other risk factors:, splenectomy (OR 17.8), infected ventriculoatrial shunts (OR 76.4), thyroid replacement therapy (OR 6.1), malignancy (OR 3.7), and chronic inflammatory conditions (osteomyelitis and inflammatory bowel disease [IBD]). The diagnosis of CTEPH is usually done after clinical suspicion with at least 3 months of effective anticoagulation. The standard diagnostic methods consist of ventilation/perfusion (V/Q) scan noting mismatched perfusion defect and right heart catheterization (RHC) which can confirm pulmonary hypertension., Other diagnostic tools such as echocardiogram, multidetector computed tomography pulmonary angiography (CTPA), or pulmonary angiography are also used in many hospitals, depending on resources and user expertise. The primary objective of our study was to determine the incidence of CTEPH in the outpatient population at our hospital and the CTEPH incidence after APE. Secondary objectives were to identify risk factors, symptoms, and duration of CTEPH after APE and describe the typical investigation methods for diagnosis and management of CTEPH in a tertiary care university hospital. This was a 5-year retrospective observational study between January 2012 and December 2016. Approval was obtained from the Ethics Committee of the Faculty of Medicine, Thammasat University, Thailand (IRB No. MTU-EC-IM-6-134/60), and the study was conducted according to the Declaration of Helsinki. All patients, more than 18 years of age, were screened from two databases of our institute, Thammasat University Hospital, a 650-bedded tertiary care university hospital in Thailand, located in Pathum Thani Province near Bangkok. The two databases consisted of the online radiology database (PACS) and electronic medical record database (E-PHIS). All patient data with CTPA were requested, the term “thromboembolism” was used in the PACS search, and the patients' hospital numbers were collected. In the E-PHIS database, patients with ICD-10 code I260–269 (pulmonary embolism) and I270–279 (pulmonary hypertension) were included. We merged the two data sets; if the same patient appeared in both data sets, s/he was evaluated as one. All 1751 patients were screened by this process: 848 from PACS and 903 from the E-PHIS database. Patients who met the inclusion criteria (age >18 years, diagnosed PE from CTPA or ICD-10) were categorized as APE or CPE. 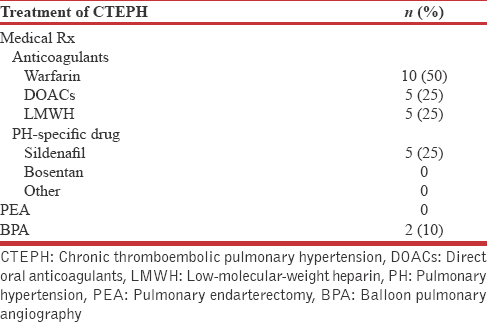 In CPE patients, they were again categorized into CTEPH or CTED. Only CTEPH patients' data were collected to establish baseline demographic data, risk factors of CTEPH, clinical and imaging characteristics, diagnostic assessments and management from the E-PHIS database, OPD cards, and inpatient summary records. Patients who had incomplete data in diagnosis of CTEPH were excluded. CTEPH was diagnosed when a patient has both of the following criteria. The first is CPE diagnosis presenting with a filling defect(s) from CTPA compatible with CPE or residual perfusion defects demonstrated by V/Q scan. CTPA results were reviewed and confirmed by the authors and an expert pulmonary radiologist. The second criteria would be a pulmonary hypertension diagnosis with echocardiogram results suggesting to be pulmonary hypertension according to 2009 European Respiratory Society (ERS) Guidelines for the Diagnosis and Treatment of Pulmonary Hypertension or 2015 European Society of Cardiology (ESC)/ERS Guidelines for the Diagnosis and Treatment of Pulmonary Hypertension or RHC with mPAP ≥25 mmHg at rest and PCWP ≤15 mmHg. Echocardiogram results were confirmed by the cardiologists. Data are presented as mean (± standard deviation [SD]), median (interquartile range), and proportion (%) when appropriate. Analysis was performed using a standard statistical program. During a 5-year period, 1751 patients were screened and 286 patients were diagnosed with PE. Among these, 188 patients had isolated APE, 50 patients with isolated CPE, and 48 patients had evidence of both APE and CPE. CTEPH was diagnosed in 20 patients with 12 of these having combined APE and CPE or a history of APE [Figure 1]. The overall incidence of CTEPH was 20/529,133 patients at Thammasat University Hospital; thus, the annual incidence was 37.8 per million patients. 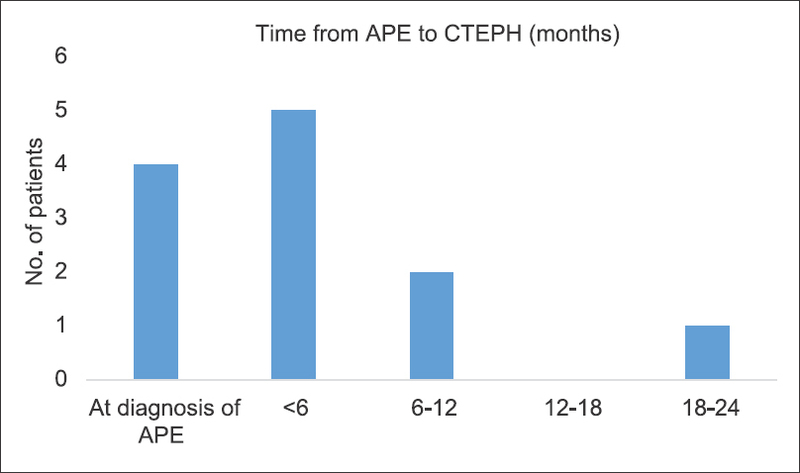 The incidence of CTEPH after APE was 5.1% (12 out of 236 patients). Of the 20 CTEPH patients, the mean (± SD) age at diagnosis was 63.4 (±16.9) years; 11 (55%) patients were female. 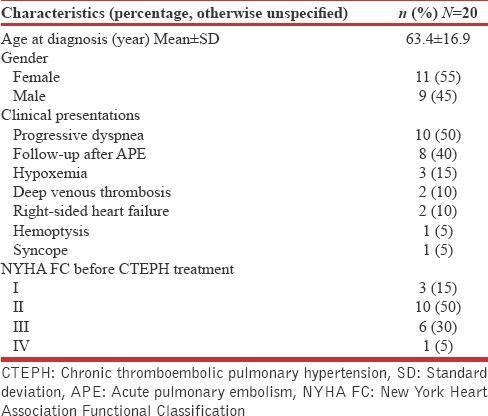 Baseline characteristics of the CTEPH patients are shown in [Table 1]. The most common clinical presentation was progressive exertional dyspnea (10 patients; 50%). Half of the patients were in New York Heart Association (NYHA) Functional Classification 2. Among 12 CTEPH patients who had APE or history of APE, CTEPH was diagnosed at the time of APE diagnosis in four patients. While another 8 cases had CTPA for follow-up after presenting with APE, 3 of these were under NYHA Functional Classification 1 at the time of CTEPH diagnosis. All were diagnosed within the first 2 years after APE [Figure 2]. 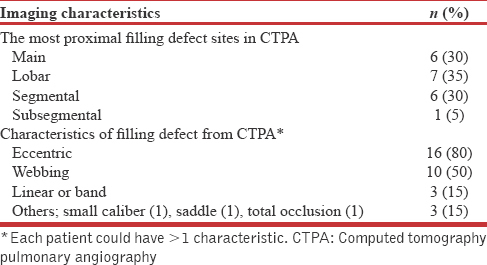 The most common proximal filling defect findings in CTPA were in the lobar pulmonary artery (7 patients; 35%), followed by main and segmental pulmonary artery (6 patients; 30%, equally distributed between main and segmental). Eccentric lesions were the most common characteristic (16 patients; 80%), followed by webbing (10 patients; 50%) [Table 2]. The most common risk factors were previous PE in 8 patients (40%), then the history of deep venous thrombosis (DVT) in 6 patients (30%). Some risk factors such as splenectomy and IBD were not found in our study [Table 3]. 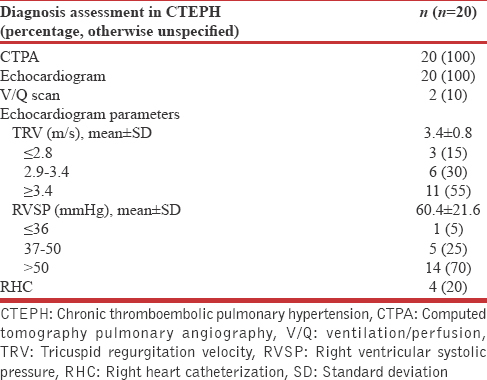 Diagnosis assessment in CTEPH was presented in [Table 4]. CTPA and echocardiogram were done in all cases. V/Q scan, which was more sensitive for diagnosis CTEPH, was obtained in two patients (10%). RHC was performed in four patients (20%). In terms of treatment [Table 5], 13 of 20 patients had main or lobar lesions from CTPA, but none of these underwent the curative surgical treatment of PEA. BPA was requested in two patients, but only one had successful BPA. PH-specific drugs, all were sildenafil, were prescribed in five patients (25%). Anticoagulants were used by all of the patients. LMWH were continuously used in 5 patients; 2 had underlying malignancy. One of our patients, who diagnosed CTEPH concomitant with APE in the same admission, died from APE had chronic DVT and underlying malignancy. The incidence of CTEPH after APE in our study was 5.1%, consistent with the previous studies which was between 0.4% and 9.1%. Most of the studies in this review are from Europe. There was one study from China in which the cumulative incidence of CTEPH after APE is 1.7% at 3 years. This variation in CTEPH incidence may arise from differences in study designs, demographic data, and diagnostic methods. In our study, 20% of CTEPH patients were diagnosed simultaneously with APE. This reflects the possibility of undiagnosed preexisting CTEPH; therefore, the rate of discovered CTEPH may indeed be lower than actual CTEPH incidence. Forty percent of our CTEPH patients were diagnosed by follow-up after APE for various reasons: For example, persistent dyspnea on exertion or evaluation before ceasing anticoagulant use in unprovoked APE for those having elective surgery. Almost half of these were in NYHA Functional Class 1. However, routine screening for CTEPH in asymptomatic patients after APE is not generally recommended., The annual incidence of CTEPH is 37.8/million patients in our institute; the incidence of CTEPH in other populations from previous studies ranges between 1 and 91/million. The low incidence makes this an orphan disease. CTEPH is a complication following APE, caused by multifactorial mechanisms. Plasmatic factors, such as VTE-related risk factors, is one of the most important. In our study, the most common risk factor is previous PE, followed by a history of DVT. Other plasmatic factors such as lupus anticoagulant or antiphospholipid antibodies were only found in 15% of patients, but about one-third of patients did not have the tests. Furthermore, an increase in factor VIII levels is rarely found in Thais, so this test was usually not done. Malignancy is the fourth most common risk factor in our study, higher than in studies by Bonderman et al. in 2005 and 2007;, this is most likely due to the absence of ventriculoatrial shunt, splenectomy, or IBD in our patients. In our context, CTPA and echocardiogram are the most useful and convenient diagnostic tools. According to 2009, the ESC guidelines for diagnosis and treatment of pulmonary hypertension, echocardiogram usage criteria are based on tricuspid regurgitation velocity (TRV) and right ventricular systolic pressure (RVSP). In 2015, ESC guidelines on the diagnosis and treatment of pulmonary hypertension, TRV is considered the predominant criteria for echocardiogram use. Hence, echocardiogram in our study is based on RVSP criteria before 2014 then based on TRV post-2014. If at least one diagnostic criterion were met, PH was diagnosed. RHC, the standard diagnostic tool for PH, was done only in cases of definite PH diagnosis that could not be done by echocardiogram. Thus, only four patients underwent RHC. Current evidence has supported pathophysiology of CTEPH as a complication after APE. After an APE episode, shrinkage of a thromboembolic mass allows restoration of a portion of the original lumen. Thromboembolic material may lead to obstruction, stenosis, and subsequent atrophy of the vessel. Some blood flow is restored by recanalization through the obstructive mass. All that remains of an organized thromboembolus are fibrous cords, which may occur singly, in bands, or may form a web-like network. CTEPH involves not only persistent organized thrombi in proximal pulmonary arteries (main, lobar, and segmental) but also small-vessel disease, which plays an important role in the development and progression of the disease. Pulmonary microvasculopathy was first described by Moser and Bloor in lung tissue obtained by biopsy or at autopsy. This microvasculopathy is observed not only in lung areas served by nonoccluded proximal pulmonary arteries but also distally to pulmonary arteries occluded by fibrotic material. Organized fibrotic clots narrowing distal pulmonary arteries can be treated by balloon pulmonary angioplasty using balloons 1–10 mm in diameter. None of the patients in our study had curative surgical treatment of PEA, although two-thirds of the patients had proximal lesions from CTPA. We could postulate that most physicians' lack of complete knowledge and exposure regarding surgical treatment is one of the keys to improving CTEPH management. Patients' symptoms and response to medical treatment is also a factor for surgical decisions. Furthermore, cultural sensitivity is important: most Thais are generally averse to surgical treatment versus medical care. To improve curative options for patients, it may be prudent to setup a public awareness campaign for both physicians and patients. Only one successful BPA in this study was done over multiple sessions, as in other studies. She was younger (38 years old), with web-like segmental lesion and FC II, highly suitable for BPA. However, another unsuccessful BPA in our hospital was male, age 42, with similar web-like segmental lesion and FC II. From these data, patient selection for proper treatment is still complex. PH-specific drugs also have certain limitations. Riociguat is not available in Thailand, and sildenafil is only available in tertiary hospitals. However, sildenafil was used less than expected; only 5 patients had been administered sildenafil while 17 patients were suitable (FC II and III before treatment). In terms of general limitations for our retrospective observational study, some data such as functional class and symptoms were not adequately recorded in medical records. Moreover, some medical records such as OPD cards and inpatient summary records are absent. In addition, there is no ICD-10 for CTEPH; consequently, we have discovered that more than 80%–90% of patients in the radiology PACS database are not present in the E-PHIS database by ICD-10. About 10% of patients who were diagnosed by ICD-10 are not presented in PACS. Of these, some had been sent for computed tomography (CT) angiography, not CTPA, hence they are not included in our search. Some are accidental findings by CT chest or upper abdomen, not CTPA. Regarding the leftover small percentage, there is no official report of CTPA, so they were impossible to determine. Incidence of CTEPH was relatively low, but not uncommon in our institute, and there is clear underuse of the standard test of V/Q scan. Suboptimal diagnosis assessment and management of CTEPH remains a critical problem. Developing a properly trained CTEPH care team would improve patient outcomes in the future. Ideally, this would be composed of a cardiologist, pulmonologist, radiologist, cardiothoracic surgeon, pharmacologist, and specially-trained nurse practitioners and nursing staff. However, allocating these resources to forming this kind of team needs to be weighed against the relative rarity of the disease. The authors wish to thank Thammasat University Hospital for providing the patients' data, Dr. Tunyarat Wattanasatesiri, MD; a radiologist for searching data from radiology PACS, Dr. Amolchaya Kwankua, MD; a radiologist for reviewing the images of all CTEPH patients, and Ms Debra Kim Liwiski for her advice in preparing the English manuscript. This study was financially supported by Faculty of Medicine, Thammasat University. Fedullo PF, Auger WR, Kerr KM, Rubin LJ. Chronic thromboembolic pulmonary hypertension. N Engl J Med 2001;345:1465-72. Wolf M, Boyer-Neumann C, Parent F, Eschwege V, Jaillet H, Meyer D, et al. Thrombotic risk factors in pulmonary hypertension. Eur Respir J 2000;15:395-9. Carson JL, Kelley MA, Duff A, Weg JG, Fulkerson WJ, Palevsky HI, et al. The clinical course of pulmonary embolism. N Engl J Med 1992;326:1240-5. McNeil K, Dunning J. Chronic thromboembolic pulmonary hypertension (CTEPH). Heart 2007;93:1152-8. Gopalan D, Delcroix M, Held M. Diagnosis of chronic thromboembolic pulmonary hypertension. Eur Respir Rev 2017;26. pii: 160108. Lang I. Chronic thromboembolic pulmonary hypertension: A distinct disease entity. Eur Respir Rev 2015;24:246-52. Lang IM, Madani M. Update on chronic thromboembolic pulmonary hypertension. Circulation 2014;130:508-18. Delcroix M, Kerr K, Fedullo P. Chronic thromboembolic pulmonary hypertension. Epidemiology and risk factors. Ann Am Thorac Soc 2016;13 Suppl 3:S201-6. Bonderman D, Wilkens H, Wakounig S, Schäfers HJ, Jansa P, Lindner J, et al. Risk factors for chronic thromboembolic pulmonary hypertension. Eur Respir J 2009;33:325-31. Wong CL, Szydlo R, Gibbs S, Laffan M. Hereditary and acquired thrombotic risk factors for chronic thromboembolic pulmonary hypertension. Blood Coagul Fibrinolysis 2010;21:201-6. Pengo V, Lensing AW, Prins MH, Marchiori A, Davidson BL, Tiozzo F, et al. Incidence of chronic thromboembolic pulmonary hypertension after pulmonary embolism. N Engl J Med 2004;350:2257-64. Bonderman D, Jakowitsch J, Adlbrecht C, Schemper M, Kyrle PA, Schönauer V, et al. Medical conditions increasing the risk of chronic thromboembolic pulmonary hypertension. Thromb Haemost 2005;93:512-6. Bonderman D, Skoro-Sajer N, Jakowitsch J, Adlbrecht C, Dunkler D, Taghavi S, et al. Predictors of outcome in chronic thromboembolic pulmonary hypertension. Circulation 2007;115:2153-8. Lang IM, Pesavento R, Bonderman D, Yuan JX. Risk factors and basic mechanisms of chronic thromboembolic pulmonary hypertension: A current understanding. Eur Respir J 2013;41:462-8. Galiè N, Humbert M, Vachiery JL, Gibbs S, Lang I, Torbicki A, et al. 2015 ESC/ERS guidelines for the diagnosis and treatment of pulmonary hypertension: The Joint Task Force for the Diagnosis and Treatment of Pulmonary Hypertension of the European Society of Cardiology (ESC) and the European Respiratory Society (ERS): Endorsed by: Association for European Paediatric and Congenital Cardiology (AEPC), International Society for Heart and Lung Transplantation (ISHLT). Eur Heart J 2016;37:67-119. Madani M, Ogo T, Simonneau G. The changing landscape of chronic thromboembolic pulmonary hypertension management. Eur Respir Rev 2017;26. pii: 170105. Jenkins D, Madani M, Fadel E, D'Armini AM, Mayer E. Pulmonary endarterectomy in the management of chronic thromboembolic pulmonary hypertension. Eur Respir Rev 2017;26. pii: 160111. Lang I, Meyer BC, Ogo T, Matsubara H, Kurzyna M, Ghofrani HA, et al. Balloon pulmonary angioplasty in chronic thromboembolic pulmonary hypertension. Eur Respir Rev 2017;26. pii: 160119. Pepke-Zaba J, Ghofrani HA, Hoeper MM. Medical management of chronic thromboembolic pulmonary hypertension. Eur Respir Rev 2017;26. pii: 160107. Delcroix M, Lang I, Pepke-Zaba J, Jansa P, D'Armini AM, Snijder R, et al. Long-term outcome of patients with chronic thromboembolic pulmonary hypertension: Results from an international prospective registry. Circulation 2016;133:859-71. Tapson VF. Acute pulmonary embolism. N Engl J Med 2008;358:1037-52. Galiè N, Hoeper MM, Humbert M, Torbicki A, Vachiery JL, Barbera JA, et al. Guidelines for the diagnosis and treatment of pulmonary hypertension: The Task Force for the Diagnosis and Treatment of Pulmonary Hypertension of the European Society of Cardiology (ESC) and the European Respiratory Society (ERS), Endorsed by the International Society of Heart and Lung Transplantation (ISHLT). Eur Heart J 2009;30:2493-537. Konstantinides SV, Torbicki A, Agnelli G, Danchin N, Fitzmaurice D, Galiè N, et al. 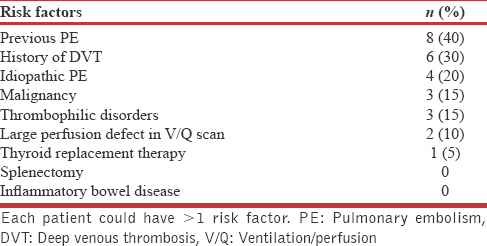 2014 ESC guidelines on the diagnosis and management of acute pulmonary embolism. Eur Heart J 2014;35:3033-69, 3069a-3069k. Taboada D, Pepke-Zaba J, Jenkins DP, Berman M, Treacy CM, Cannon JE, et al. Outcome of pulmonary endarterectomy in symptomatic chronic thromboembolic disease. Eur Respir J 2014;44:1635-45. Yang S, Yang Y, Zhai Z, Kuang T, Gong J, Zhang S, et al. Incidence and risk factors of chronic thromboembolic pulmonary hypertension in patients after acute pulmonary embolism. J Thorac Dis 2015;7:1927-38. Guérin L, Couturaud F, Parent F, Revel MP, Gillaizeau F, Planquette B, et al. Prevalence of chronic thromboembolic pulmonary hypertension after acute pulmonary embolism. 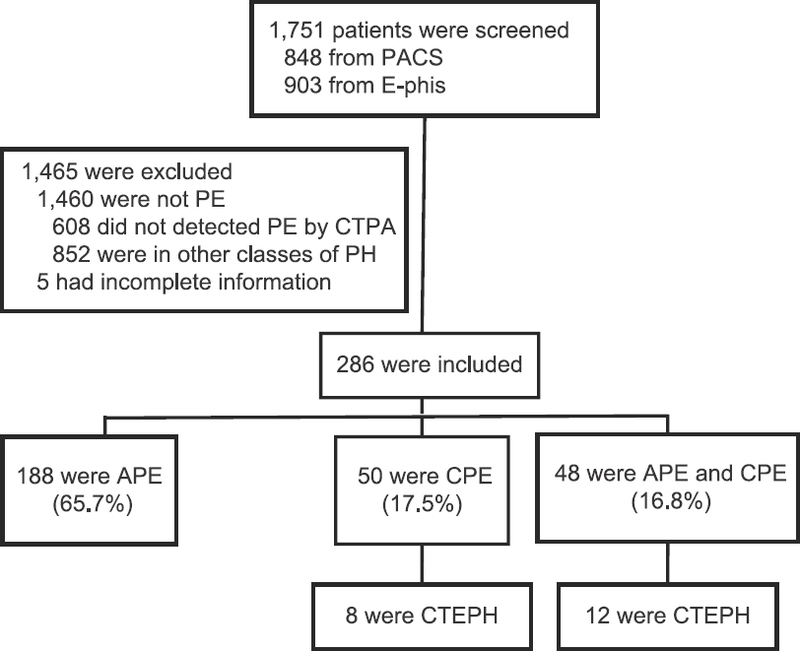 Prevalence of CTEPH after pulmonary embolism. Thromb Haemost 2014;112:598-605. Fedullo P, Kerr KM, Kim NH, Auger WR. Chronic thromboembolic pulmonary hypertension. Am J Respir Crit Care Med 2011;183:1605-13. Castañer E, Gallardo X, Ballesteros E, Andreu M, Pallardó Y, Mata JM, et al. CT diagnosis of chronic pulmonary thromboembolism. Radiographics 2009;29:31-50. Kim NH. Group 4 pulmonary hypertension: Chronic thromboembolic pulmonary hypertension: Epidemiology, pathophysiology, and treatment. Cardiol Clin 2016;34:435-41. Moser KM, Bloor CM. Pulmonary vascular lesions occurring in patients with chronic major vessel thromboembolic pulmonary hypertension. Chest 1993;103:685-92. Pepke-Zaba J, Delcroix M, Lang I, Mayer E, Jansa P, Ambroz D, et al. Chronic thromboembolic pulmonary hypertension (CTEPH): Results from an international prospective registry. Circulation 2011;124:1973-81.